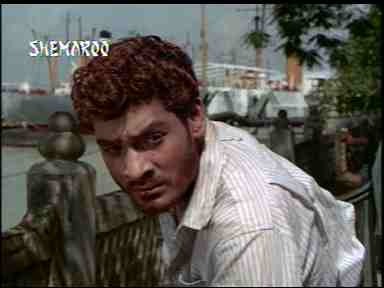 Spurred on by Memsaab and Todd‘s posts on ‘Jalte Badan’, I decided to watch ‘Sambandh’. Deb Mukherjee looked sufficiently debauched on the VCD cover. An orange haired Deb Mukherjee runs across a tea estate, greeting workers. The supervisor (Janaki Das) offers a girl to him. Deb Mukherjee leers at him, and I rub my hands together in anticipation. But it turns out that Deb is only leading the supervisor on. In the next moment, he slaps him. His employer Mrs. Sen (Anita Dutt) is led to believe that Deb is living with a woman, who turns out to be his sister, actually his friend’s sister, who has left her understanding husband back home, to take care of her melancholy Manav-da. 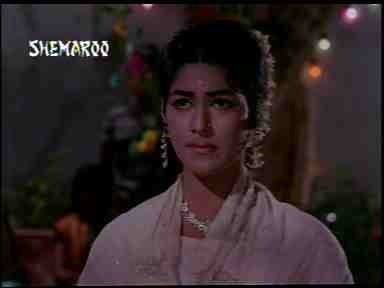 Asha (Vijaya Choudhary) tells Mrs. Sen that her Manav-da (Deb) is very lonely, very misunderstood. Deb meanwhile careens down the hills in a jeep. ‘Chal akela, chal akela’ plays on the sound track. I am still hoping that Deb’s back story will reveal a life of debauchery, and then repentance. Certainly, the orange-ness of Deb’s hair and beard lead me to think that he cannot be all good. 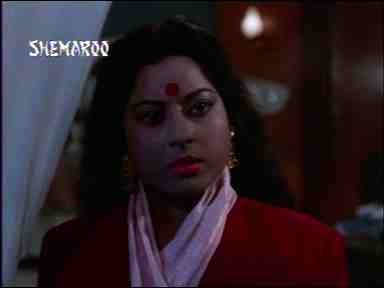 But the film turns out to be a Bengali melodrama made in Hindi. What we have is a father, Umakant Chatterjee (Pradeep Kumar) who for some time also sports orange hair, before he thankfully goes gray. Umakant is a rich zamindar burdened by his ancestors’ exploitation of the peasants. Instead of doing anything to help the peasants, he drinks to lessen his ‘ghum’. When his ancestral haveli is claimed by the moneylender, Hiralal (Ulhas), he distributes the money the government has given him in lieu of his zamindari between the peasants, and leaves with his wife Sumati (Sulochana) and son. When a friend offers them his home, Umakant lets Sumati and Manav go to the friend’s house, without even dropping them there, and goes off to Calcutta to find a job like a common man. Why he could not have worked while he still had the haveli, is of course not questioned. He does not leave any address behind. Nor does he give his wife his address when he writes to her from Calcutta. While wandering on a beach, he meets Shanti (Anita Dutt) who paints him, and sings about the iniquities of God, who has made everyone unequal. Crippled beggars beg, while foreign tourists ride camels. Shanti asks Umakant to come home. When he visits her, her father promptly hands over his business to him, and Umakant goes on to become a rich industrialist. Shanti would like to marry Umakant, but he tells her he is already married, at which she goes and marries someone else and is happy. Then, we have a mother, Sumati Chatterjee (Sulochana). When her husband does not get a job for 2 months, and does not send her his address, she decides to leave the friend’s house, and go looking for her husband in Calcutta. She hopes to stay with a relative there. But the relative has moved home 3 years ago. Mother and son walk the streets of Calcutta, hungry and tired. After 2 days of hunger, Manav crashes a party and sits down to eat with the guests. A waiter catches him and begins to scold him. The host Satish (Abhi Bhattacharya) and Anupama (Achala Sachdev) reprimand the waiter for scolding a hungry boy, and get a servant to bring in Sumati as well. Sumati tells them her story, and promptly Satish and Anupama invite Manav and Sumati to stay with them. Anupama wants to hand over the household to Sumati and wants Manav to call her mother. Sumati decides that she must continue looking for her husband, but her son will be cared for amply by these strangers, and abandons him in the night to their care. Before leaving, she sings a sad lullaby for Manav, describing motherhood, and how Manav will one day carry her dead body. and has lots of money in his pocket. But nothing makes up for the loss of his parents. When Anupama’s niece, Sandhya (Anjana Mumtaz) comes to study in the city, Manav falls in love with her because she resembles his mother. She falls in love with him because he is always so sad. There is no end to his sadness. 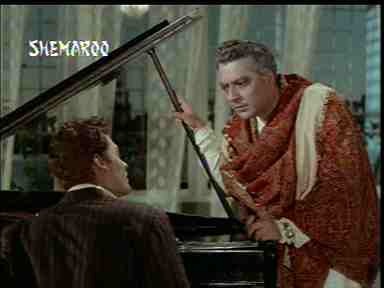 When Anupama throws a birthday party for him, he bombards the guests with ‘Yeh khushi lekar main kya karoon’. He refers to his lost mother and father again and again, and Anupama, hurt, faints. He promises Anupama that he will never leave her. In the very next scene, Anupama starts behaving weirdly with Manav and then leaves the city without informing him. There is a kind of shorthand in the narrative, which is disconcerting, and yet makes the film more tolerable. Things are never sufficiently explained, and this gives the melodrama an air of unpredictability. We learn later that she has gone away to have her own child, in secret, away from Manav. Once she has her own son, she starts resenting Manav’s presence in the house. And he is forced to leave. Manav meanwhile has met his father, but does not reveal his identity because he does not want to hurt Anupama. Though he sings yet another mother-father song to Umakant who looks puzzled and also feels a deep pain in his chest, looking at this young man, with curly orange hair so much like his own. Manav suffers one blow after another. Sandhya who turned out to be Hiralal’s daughter, is now getting married elsewhere. Her father who approved of Manav when he was Satish and Anupama’s son, now obviously thinks she can do better. Manav finds his mother, but when he is bringing her back to his father, she dies of happiness and also TB. Manav sings and sings songs full of woe, whenever he can. Though he barely opens his mouth to synch with Mahendra Kapoor’s full-throated voice. Umakant always feels pain for him. Manav, much like his father, drinks to drown his ‘ghum’. All the women, fair, round-faced and very Bengali, look at Manav with adoration, feel very sorry him, and touch him all the time. Mrs. Sen, Manav’s employer is also conveniently Shanti, his father’s benefactor. She brings father and son together, after hearing Manav’s story after a drunken song. Of course, Manav saves his treacherous foster-mother from a fire, and Sandhya, thereby earning Hiralal’s gratitude. The ancestral haveli, now once again Umakant’s, who has bought it, burns. Umakant stops the villagers from dousing the fire, because the haveli has been built on the sweat and blood of patients, and is full of his dead wife’s sighs. The villagers look at the burning haveli, wondering if they could not have used it as a school. Sandhya, re-united with Manav, is held firmly in a fatherly grip by Umakant, while he moans about his dead wife. Sandhya does not look happy, as she imagines a life full of sad songs between father and son. Mrs. Sen stresses on the fact that finally Manav and Umakant have found their true ‘Sambandh’ – relationship. At this point, I want to break into a sad song. The film denies any possibility of love from anyone who is not a ‘real’ father or a ‘real’ mother. I would rather have watched a more sleazy ‘Sambandh’. Shweta, Yes, Deb is quite nice. I’d like to see him in another kind of a role. His jawline was too strong to be playing such a rotru role. Thanks, Violet. Oh yes, I had forgotten Howard Roark’s orange hair. How could I? I like orange hair in general. Mine was orange for a long time, in the mehndi coloring days. 🙂 But orange hair and melancholy just don’t seem to go together. Wonderfully written review, but poor dear, how you must’ve suffered through the film. Honestly, I too thought the title of the film was suggestive, but then that Chal Akela song is something else, so I avidly read what you’d written. Orange hair – a bad colouring job (mehndi mein milavat?) or failure to oil hair everyday (to think I’m talking of filmstars here) or a hitherto suppressed ancestral gene? Intrigued me, this description. Anjana Mumtaz – I could barely recognize her, I remember her from Buniyaad. Deb does look good, doesn’t he, with his flaring nostrils and all? Harveypam, perhaps I haven’t been coherent enough. Or perhaps it was just the plot. 🙂 Yes, they did everything in their power to keep Deb sad. BTW is Anjana Mumtaz’s child from Deb? Why, would be a futile question to ask, wouldn’t it be? BTW you were coherent, but I think, I was enjoying your write up so much that I didn’t pay any attention to the plot. wonderful. One needs to read this review after watching a movie like this. Personally I save myself the troubles of watching movies. This movie had such awesome songs. Your review has some nice observations it it, viz. it is a Bangla movie made in Hindi- and that explains the slowness of the story. Everyone wanting to remain sad- that was so very Nimmi like. I am told that Nimmi was rarely seen in any other state except in the state of sadness in Hindi movies. Great review Banno. But you must agree , the songs were wonderful. At least some of them. O.P.Nayyar has done a good job, but O.P is not a right music director for such a sad movie. Thank you, Suniti. Yes, the songs were good. I always associate O.P. Nayyar with foot-tapping music, castanets, horses trotting. The best review I’ve ever come across of any sad Hindi movie. Although, I have’nt seen it, I could picture the whole sequence in my mind with a LAUGHTER MUSIC playing in the background. Thank you, Atya. 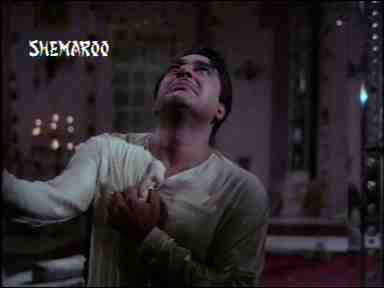 Though I must say, this is not a sad Hindi movie. It is hilarious. Banno, for some reason today, instead of summarising a 2500 word article into less than 200 words – they seem to think I’ve a magic wand – I’m procrastinating by reading the ‘top posts’. I don’t know, and don’t care why Deb was sad – I lost track of the reason and the characters midway through your review – but your review was hilarious! I’m so glad I finished drinking my tea before I began reading this! It was one weird movie. I did like all the songs. And Deb looks so good as a tortured soul. This review is superb, made me laugh, just something you need after watching a maudlin movie. Deb Mukherjee is my favourite. 🙂 Tortured soul.